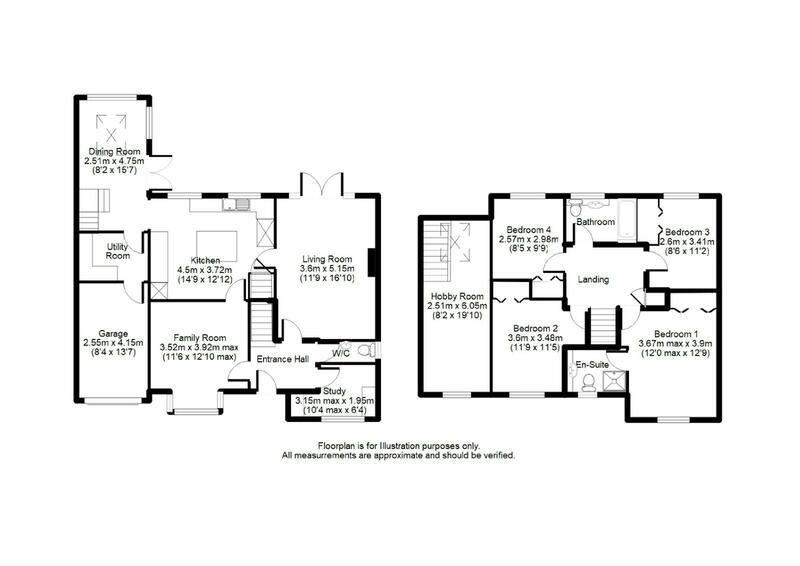 Staircase to first floor, radiator, doors to Lounge, Dining Room, Study & Cloakroom. Side aspect double-glazed window. Low level w.c., wall mounted hand wash basin with mixer tap, extractor fan, fully tiled walls. Front aspect double-glazed window. Radiator, laminate flooring. Front aspect walk-in double-glazed bay window. Radiator. Rear aspect double-glazed window and French doors to rear garden. Feature fireplace with inset gas fire, two radiators, wall lighting. Two rear aspect double-glazed windows. Comprises a range of eye and base level units with granite work surfacing and one and a half bowl sink and drainer with mixer tap, space for range cooker with extractor over, space and plumbing for dishwasher, space for fridge freezer, central island with granite work surface, under stairs walk-in cupboard, coved ceiling with inset spot lighting, opening into dining room. Comprises a range of eye level units with roll edge work surfacing below, space and plumbing for washing machine and tumble drier, space for fridge, radiator, courtesy door to Garage. Dual aspect with rear aspect double-glazed window and side aspect double-glazed window and double-glazed French doors to rear garden plus additional Velux window. Radiator, door to Utility Room, open-tread turning staircase to galleried Landing/first floor hobby room. Dual aspect with front aspect double-glazed windows and rear aspect Velux windows. Vaulted ceiling, Radiator, laminate flooring, wall lighting. Access to loft via hatch and pull down ladder, airing cupboard. Front aspect double-glazed window. Comprises a fully tiled shower cubicle with extractor fan, vanity unit with inset wash basin and mixer tap with storage beneath, low level w.c., heated towel rail. Front aspect double-glazed window. Built-in wardrobes, radiator, wall lighting. Rear aspect double-glazed window. Built-in wardrobes, radiator. Rear aspect double-glazed window. Comprises a panel enclosed 'Jacuzzi style' bath with mixer tap with independent shower above, vanity unit with inset wash basin and mixer tap with storage beneath, heated towel rail, extractor fan. To the rear of the property with a South-Easterly aspect, the garden comprises a paved patio and timber sun deck, with a dwarf brick wall and steps up to the remainder, which is mainly laid to lawn. There is a further raised timber deck to the rear of the garden and herbaceous borders. Enclosed by wood panel fencing, timber shed to side of the property, outside lighting and tap, gated side access to the front of the property. To the front there is block paved parking for several vehicles. It is low maintenance with herbaceous shrubs, small timber store, outside lighting, gated side access to the rear of the property. A single garage with up-and-over door, courtesy door to Utility Room, light and power, wall mounted boiler.